Throwing up an impenetrable wall of fire, Phalanx is one of the deadly last lines of defence for Britain's warships. It is fitted to Type 42 and Type 45 destroyers and Bay, Wave and Fort Victoria-class ships in the RFA. Capable of engaging targets around one mile away, Phalanx is a radar-controlled Gatling gun which fires 20mm shells, spewing out 3,000 rounds a minute. 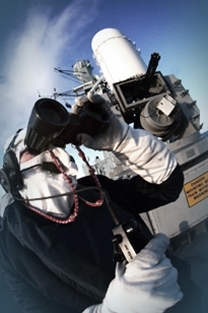 Like Goalkeeper, it is designed to engage incoming enemy aircraft and missiles if they penetrated a ship or task group's outer ring of defences such as Sea Viper or Sea Dart. During Operation Telic, Phalanx guns were removed from ships and were crewed by sailors defending Basra airport, the hub of British operations in southern Iraq. The guns saw extensive action against incoming rockets and mortars fired by insurgents.